Japan’s fantastic skiing and snowboarding conditions have long been a well-kept secret, but word is slowly getting out and more people are discovering this hidden gem. Japan has some of the best ski resorts and soft powder snow in the world. There are more than 600 ski resorts through-out the country with the ski season officially starting in December. The best months are considered to be January and February with the best conditions offered during this time. The three best areas for skiing in Japan are Nagano in the Japan Alps on the main island of Honshu, Hokkaido, the island furthest north in Japan with Siberian-blasted highlands, and Niigata also on the main island of Honshu on the Sea of Japan coast. Nagano is only a short two hour bullet train ride from Tokyo, and offers some of the best resorts in Japan. It was home of the 1998 Winter Olympics and a fabulous place to ski or snowboard. Nagano’s winter season is December to early April. One of the highlights is Hakuba, with its snow laden peaks and valleys. Hakuba has deep winter snow falls and plenty of soft powder snow with seven different ski resorts. One of the best ski resorts in Hakuba is Happo-One with excellent mountain views and runs for beginner, intermediate and advanced skiers and snowboarders. Shiga Kogen is also highly recommended and hosted several events at the 1998 Nagano Olympics. It is in fact one of the largest ski resorts in the world. It offers 21 different areas with a variety of terrain to suit all styles and type of skiers and snowboarders. Hokkaido is about a 90 minute flight from Tokyo and was also a Winter Olympic venue in 1972. Hokkaido’s winter season is November to early April with some ski resorts still having snow until early May. Sapporo is the cosmopolitan main city on Hokkaido, but does not get a lot of snow until early December. The best places are ski resorts like Niseko, Furano, Rusutsu and Kiroro. Niseko is probably the best ski resort in Hokkaido and can be reached either by bus or a picturesque train journey through beautiful winter landscapes. Niseko is exactly what you would expect a Japanese ski village to be. It is a blend of traditional Japanese houses and environment with modern touches such as traffic lights, apartments and hotels. The skiing in Niseko is first class, featuring deep snow, long runs and soft powder snow. The Niseko ski area usually receives around 15 meters of snow every year. Day tickets are cheap, usually about half of what you would pay in Australia and with no long lift queues as there are 43 lifts. Niseko United is the name of a group of four connected resorts here that you can ski or snowboard on with a single all-mountain pass. Niigata located on the Sea of Japan coast in the Chubu region of Japan is just over 2 hours away from Tokyo. 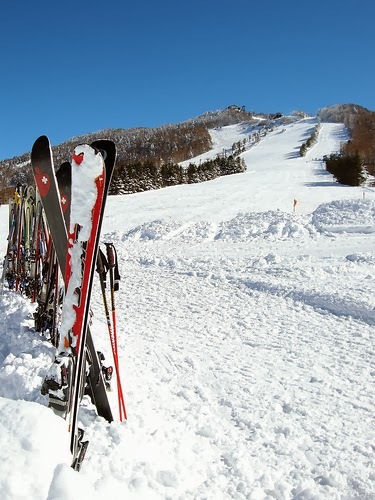 Niigata offers over 50 ski resorts and excellent skiing and snowboarding conditions. Most of the resorts are either located in the Myoko or Yuzawa area. One of the best is the Naeba Ski Resort in Yuzawa with 27 courses of varying skill level. It has been very popular now for many years due to is easy access from Tokyo (80 minutes by train) and long snow season. The ski season runs from November to May. Lift pass usually range in price from 4000 yen ($40 USD) to 5500 yen ($55 USD) a day. Ski gear and clothing can be hired at most resorts, and is very reasonably priced. Full equipment rental might cost you around 5000 yen per day ($50 USD). If you have any recommendations of places, please leave them in the comments below. Hachimantai is great from Tazawa-ko to Towada-ko, still a secret. Hi Llewellyn, Looks like an amazing place with beautiful landscapes. I'd love to go hiking there. It's got to be skiers Heaven, these days !